Agios Nikolaos is a beautiful hilly town on the shore of the Mirrabello bay. Enjoy a coffee or ice cream next to the famous “Ag. 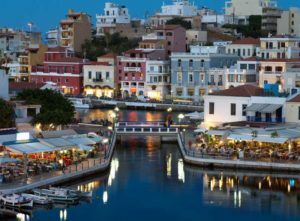 Nikolaos lake”, a walk to the port or dinner next to the sea at one of the many taverns and restaurants. Elounda is one of the most beautiful resorts in the Mediterranean sea and boasts some of the best and most luxury hotels in Europe. In Elounda the atmosphere is always relaxing, the sea is always calm, and the sun is (almost) always shining. Spinalonga is a tiny island, across the water from Elounda. This tiny island has an amazing history. The Venetians build a fort there to fence off the pirate raids which is still intact. The last time the island was inhabited was when it was used as a leper colony from 1903 to 1957, and was one of the last active leper colonies in Europe. The last inhabitant, a priest, left the island in 1962. Today Spinalonga is visited by thousands of tourists each year.